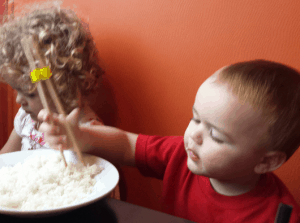 Home»All»Mama Fu’s Asian House – BigKidSmallCity’s Search for Houston’s Best Kid Friendly Restaurants! 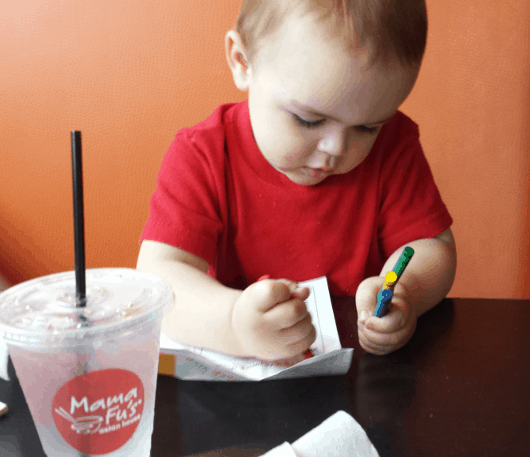 Mama Fu’s Asian House – BigKidSmallCity’s Search for Houston’s Best Kid Friendly Restaurants! 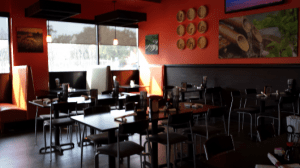 Mama Fu’s Asian House just opened on West Gray Street in Montrose. It is the first franchise in Houston and will be followed by 17 more locations in the next 10 years. The franchise owners invited some bloggers out to visit last month. I went, ate my way through the menu, and then went back with my kids over winter break. Mama Fu’s is located in the shopping center with Marshall’s and TJ Maxx at West Gray and Dunlavy. The lot is big and there is never an issue parking. 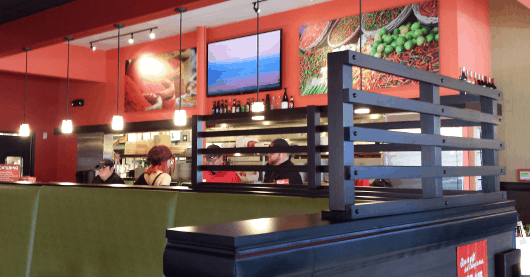 Mama Fu’s is a split between counter service and table service. 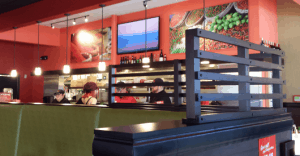 On week days, you order at the counter and the food is delivered to your table. On evenings and weekends, you sit and place your order with the the staff. Inside the restaurant is casual by stylish, with tall orange booths and big windows. There is a large stack of high chairs and booster seats, along with a kids menu, crayons and chopstick helpers, so you know kids are welcome here. The bathrooms are brand new, very nice and have a changing table. At the blogger lunch, we were told that everything is made fresh and we could customize almost anything. So, if we wanted veggies instead of meat or tofu, we could do it. The same goes for rice vs noodles. Or just about anything. When I went back with the kids, we did make a few changes to the menu and the staff was happy to comply. 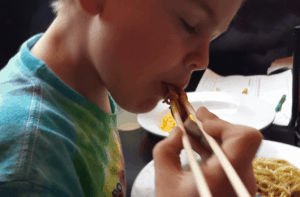 The kid’s menu includes: Ninja Noodles (chicken over egg noodles), Dragon Tails (chicken tenders), Sweat-n-Sour, Mei Mei’s (chicken fried rice with egg and carrots), Scooby “Fu” (honey glazed chicken) and Teriyaki. All meals are $4.59 and include a choice of side, drink and fun chops. We ordered the Ninja Noodles, with tofu, and a side of Mac and Cheese and another Ninja Noodles, with chicken, and a side of rice. (Carbs. I know, I know.) When they arrived, I was surprised at how huge the servings were. James and Brooke shared just the rice and had no room for noodles. I ordered the Lettuce Wraps with tofu ($6.49). The “regular” (not the “large”) was very big and was more than I could eat for lunch. It was good, but next time I’m going to ask for more veggies to be added. I asked the chef and he said this would be no problem at all. At the blogger lunch, I tried many other items. 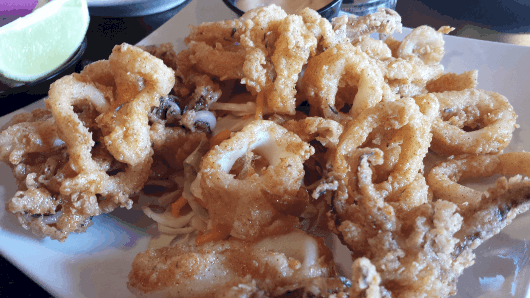 All were good, but the calamari ($5.99) was especially good. It was crisp and not chewy. I should also mention that there is a Vegan and gluten free menu, so we can take Uncle Craig next time he’s in town. The service was very good. 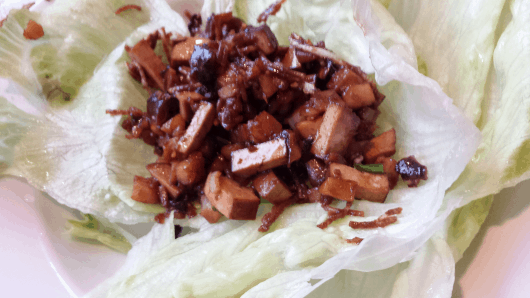 When the kids stole and ate my lettuce for the wraps (like bunnies), the waitress brought some more, free of charge. I thought the prices were very reasonable, the food was good and the restaurant was very welcoming to families. We’ll be back a lot I’m sure. How do you deal with harsh criticism and mean people? You asked BigKidSmallCity!